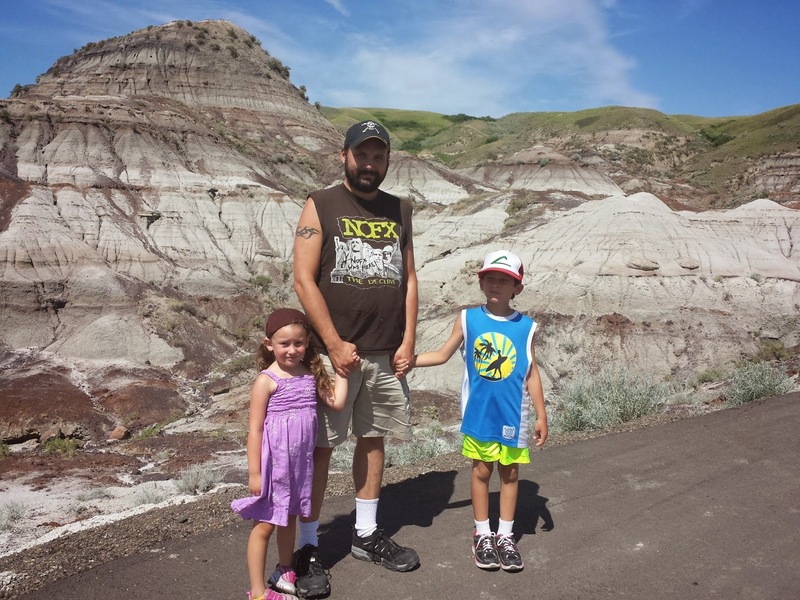 For the final day of our Alberta vacation, we checked out of the hotel in Lethbridge, said goodbye to my sister, Mark, my dad and Shai (*sniff*) and headed to Drumheller to see the Dinosaurs! 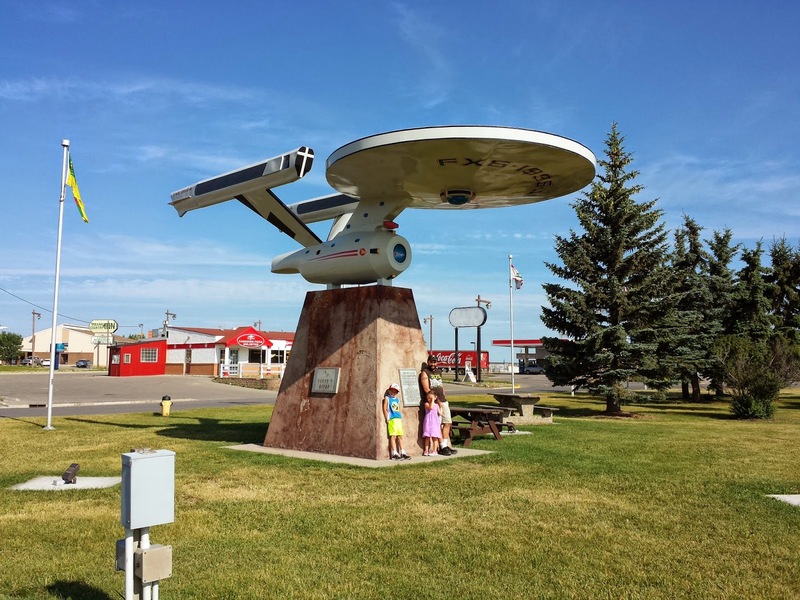 To get to Drumheller from Lethbridge, you need to drive through Vulcan Alberta. 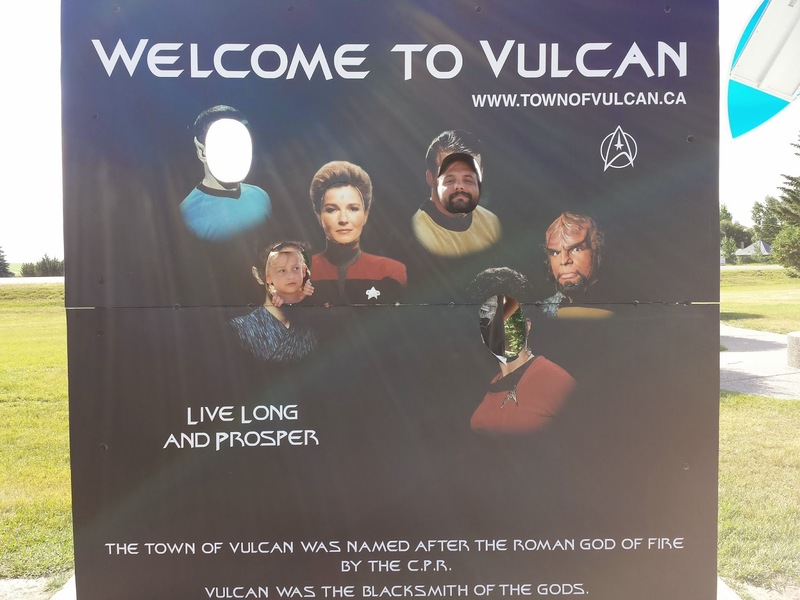 We thought to ourselves as we were driving through, "When are we ever going to be in Vulcan again?" So of course we had to pull over and do some touristy stuff. Live long and prosper. Can you see Lane and Terry peeking out from 2 of the faces? 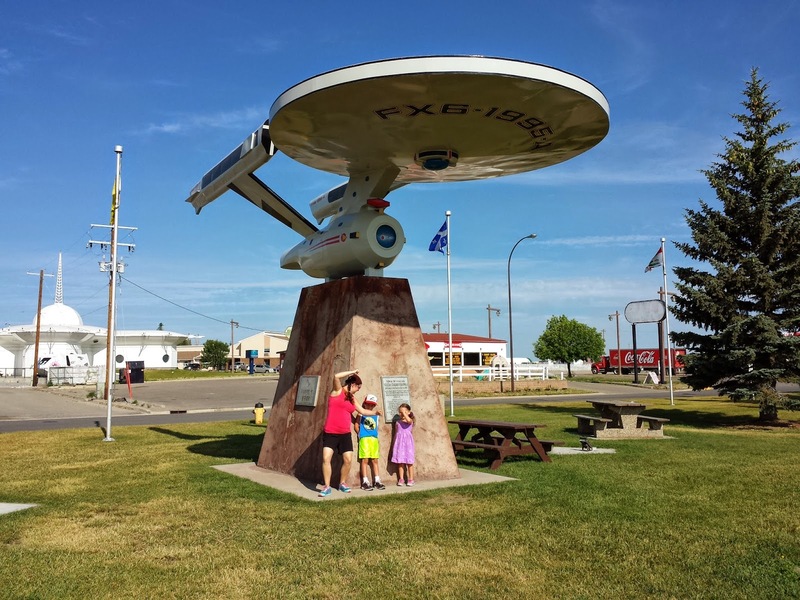 Then we posed underneath the Enterprise. I don't think the kids were all that impressed. But the time allowed for them to get out of the car and stretch their legs, so they humoured us. I tried to get them to make funny faces... but nope... nothing. 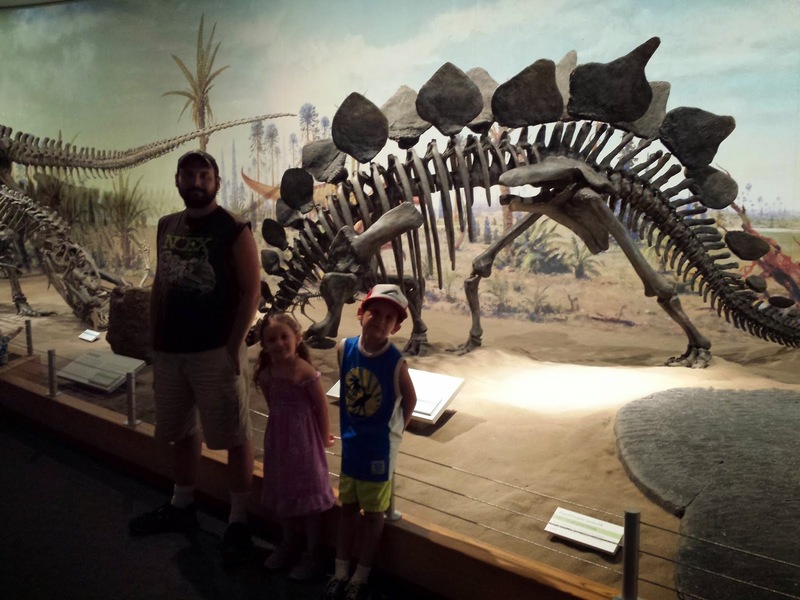 The Royal Tyrell Museum in Drumheller is fantastic! 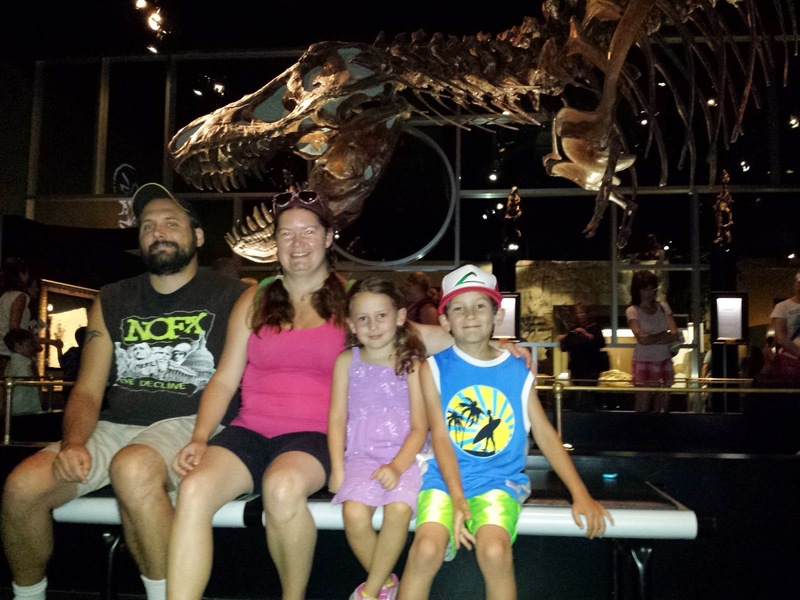 Uncle Davan (my brother) took a photo of the family with a T Rex in the background. We looked at a display of the sea life that started animal life on earth. 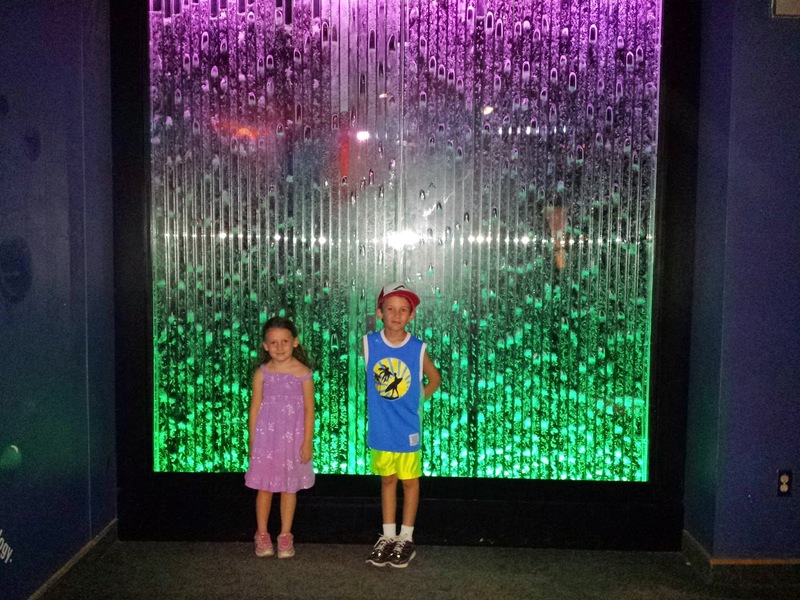 Logan and Lane loved the neon colours and the water running down inside the tubes. Don't look behind you. 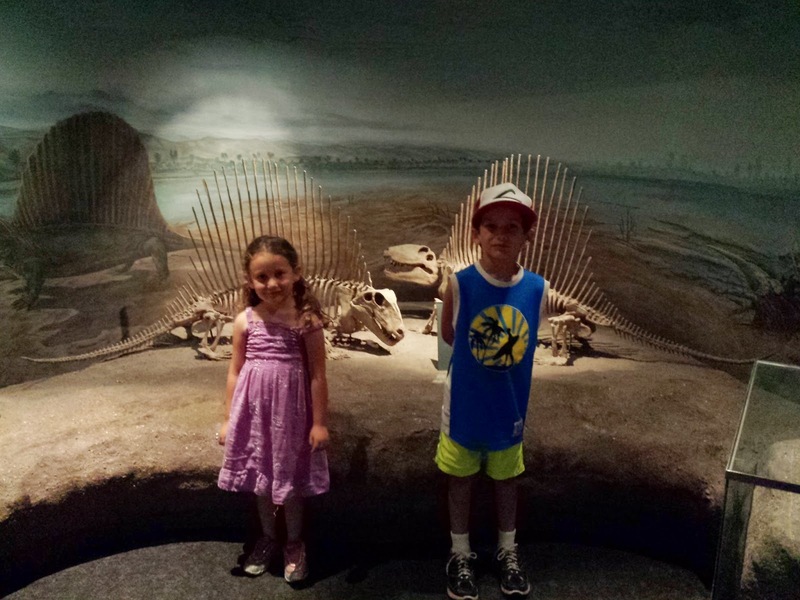 There seems to be two mischievous dinosaurs following my children. Stegosaurus. I suddenly have the urge to sing the dinosaur song by the Doodlebops. Stego - Stego - SAURUS!!!! 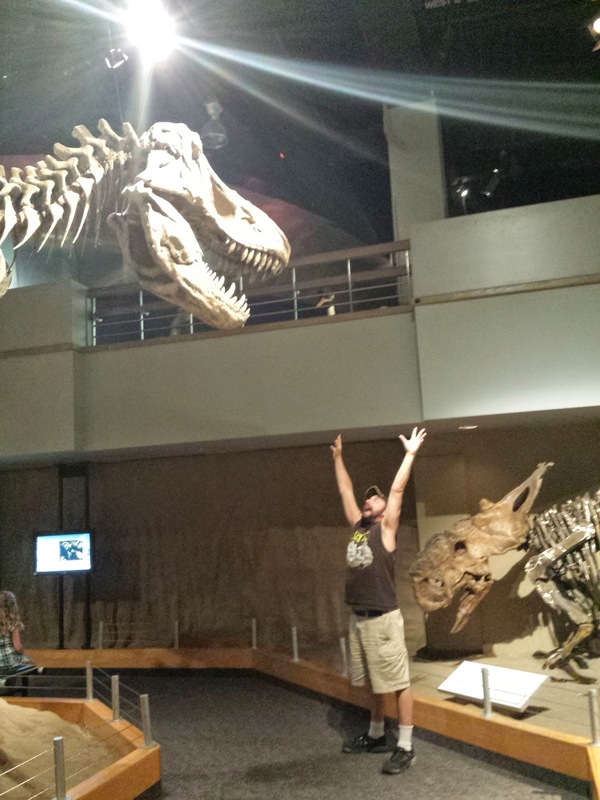 Somehow I think that the T Rex isn't your biggest problem Terry. There's a Triceratops sneaking up behind you hehehe. Then we went outside in the heat. Terry and I both recollected about the times we visited this museum when we were kids. We both remembered the horrible heat of this valley. 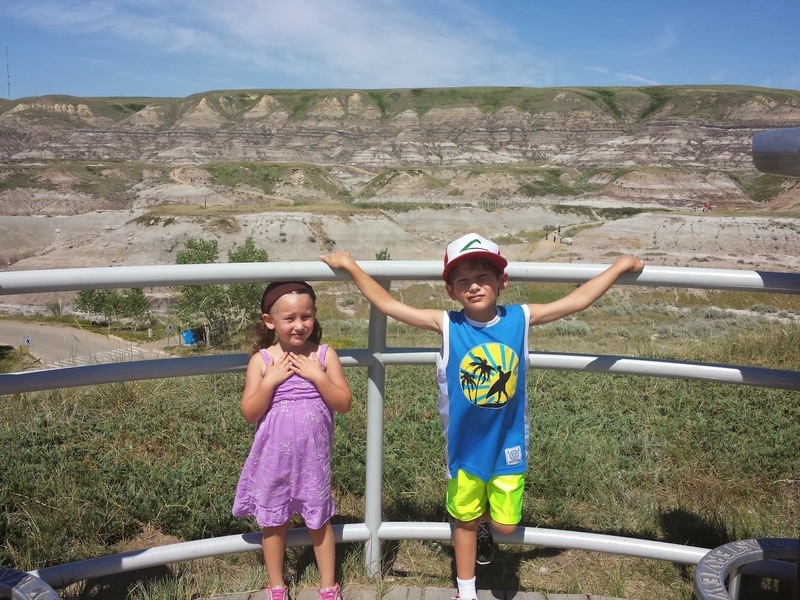 We warned the kids that Drumheller was just scorched earth and the hottest place on earth. 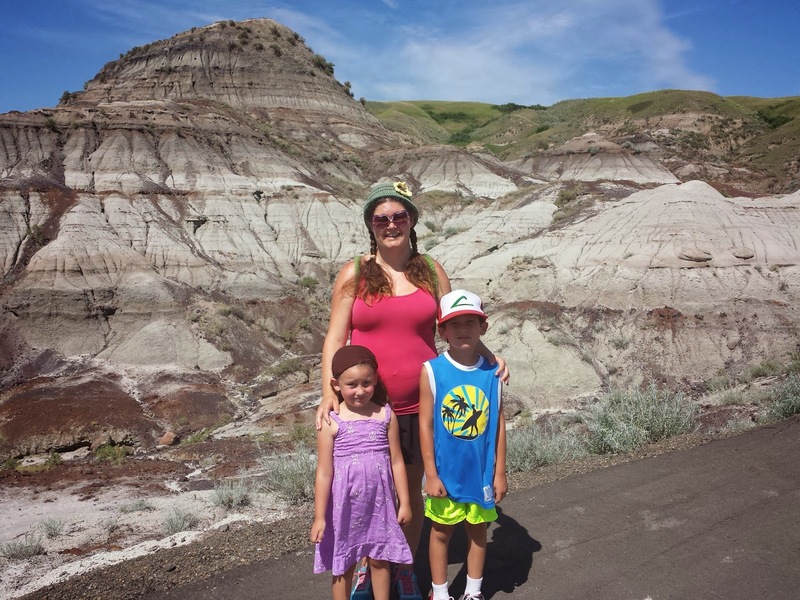 And Drumheller didn't disappoint. The most friggin' hottest, driest, craziest temperature awaited us when we arrived. But look at all the strata in the rocks behind us. Them there hills are filled with dinosaur bones! Lane refused to wear her hat. Luckily I brought mine and let her borrow my headband to cover that head. So hot! Unfortunately, we didn't have time to drive down HooDoo trail. :( We had to get in the car and drive down to Medicine Hat so that we'd have a head start on the next day's long trip home. When we arrived at Medicine Hat, we looked up where the Days Inn was. Terry loves the Days Inn because they have free continental breakfast (remember that story?) 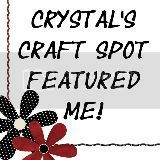 We inquired at the desk and they had one room left that would fit our needs - the honeymoon suite! They gave it to us at regular price so we decided to take it. Oh my gosh - we were living fancy for a night. There were basically to parts of the huge room with two TVs so we didn't have to watch cartoons with the kids. 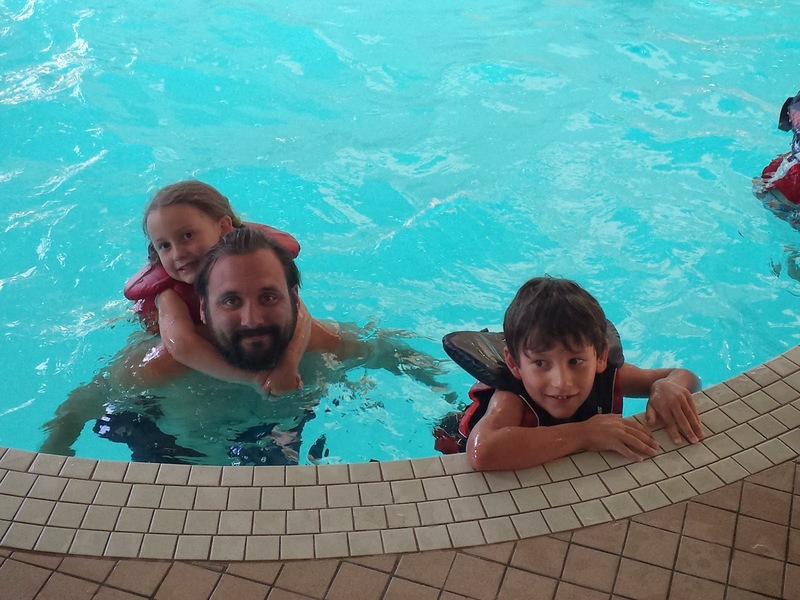 And of course, there was a pool and a waterslide. 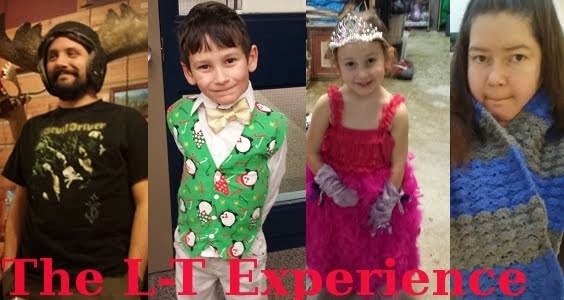 The kids were in heaven. 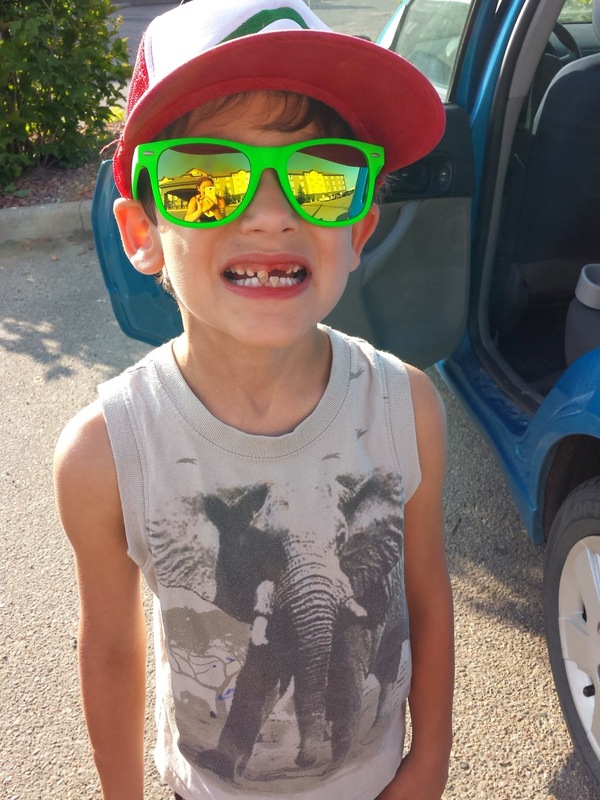 In the morning before we headed out for the long drive home, Logan lost his front tooth on the free cookie the Front Desk person gave to him. Bloody!